I waited months longer this year, three months to be exact, to plant because last year I had leggy overgrown plants and I had to start over last year after a late and heavy frost. I feel behind this year. 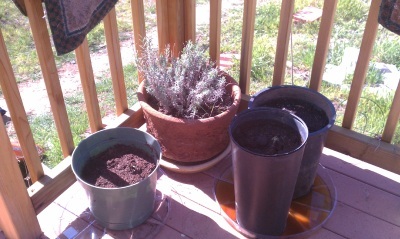 In the left pot is a couple of Bocking 14 comfrey plants; the back is lavender, and the two right are rhubarb. I found out by accident that while rhubarb dies in the ground here, it does wonderfully well in deep pots. Who knew? I’m looking forward to rhubarb pie finally. And the leaves won’t be wasted even though they’re poisonous, they’re a good dye plant. Yay! 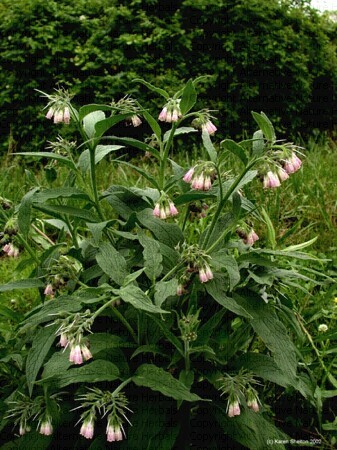 Far left is more Bocking 14 comfrey; they were supposed to send me six plants but I got 8, hence the two in the other pot. These are only temporarily in the pots until I dig and compost near the fence where they’ll be permanently situated. 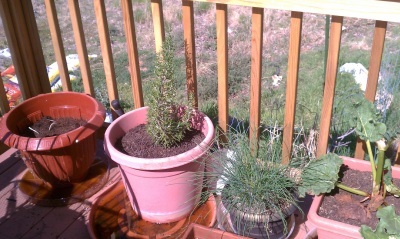 Next left is rosemary, to replace the rosemary that died; next to that is chives, and far right is my rhubarb plant which is so happy it was even trying to blossom until I snipped it off…I want leaf stalks, not flowers! It tends not to produce as much edible foliage if it is allowed to flower, and it also does not tend to produce viable seed due to its long history of cultivation via splitting the root bunch. 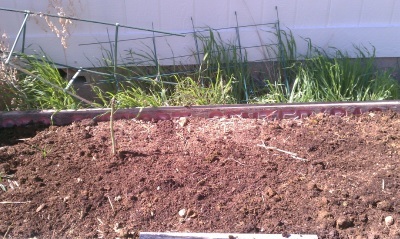 My asparagus bed. The chickens, when they accidentally ‘got free’ without supervision, dug up my asparagus roots over the winter and I thought they had killed them all. I just planted more, so the entire bed is now dedicated to asparagus; happily, I found when I was trenching for the new plants, that they had killed fewer of the established plants than I had thought. That is good, because we have been dedicatedly NOT eating the asparagus for the last three years, patiently waiting for it to get firmly established before we began gorging ourselves. What else was planted today? A 4 x 4 bed of carrots, hopefully that will mature and be out of the bed before I need it in June. Lettuce, turnip greens, green pepper, roma tomatoes, cherry tomatoes, green chiles, and orach. The white eggplant I think are done; being stepped on was not a good experience for them. I transplanted them from the little peat buttons into compost in the hope they’ll do better; we’ll see. More of the purple survived the trauma and they tend to produce better anyway in my experience. We’ll see how it goes; I still have time and I may just plant another six or so to cover my bets. One loofa seed from my Christmas loofa gift basket has sprouted! I got a basket with soaps and a loofa from the Guild Christmas exchange. I planted the four seeds that were left inside it and I wasn’t expecting anything at all so that was a fantastic surprise. I got more loofa seed anyway just in case. A plant that is edible and is useful as a scrubby? How can you go wrong? I’m pleasantly tired, and very dirty. If only this wind would stop! I’m starting to understand why settlers in Wyoming went mad from the wind. We have no power, no telephone (but cell works) no water. A transformer went last night. DH is grateful for the solar power that is allowing me to make a new blog post; I’m grateful for the kerosene lanterns, the candles, the pressure cooker, the rain barrels (for flushing) and the Berkey filter system for drinking water, as well as for our food storage. Lesson learned. We definitely still need a wood stove. It’s about 58 in here, and sure to drop lower tonight; we need lanterns with better light than the kerosene lanterns so rechargeable solar lanterns are definitely in our future; we need drinking water storage. And a toilet seat for the bucket that is in the bathroom so that we can just take the urine out to the garden on a daily basis. All in all, not so bad. We’ll be playing guitar, I’ll be going to bed early (I work tomorrow anyway) and I have a propane camp heater for the bathroom so I can get around in more than 45 degree temps. Supposedly they’ll have the power back up by tonight; I’m not holding my breath. We’ll be OK if it doesn’t come back right away. After all, with a failing infrastructure it’s the wave of the future. Apparently others at my job are sick, too. One of our major administrators just took a job elsewhere; this is someone who has been at this facility for a LOOONG time, and who I would have thought was a lifer with our organization. I guess it’s getting to her too. Interesting. Makes me wonder if the pressure is from the newish CEO or if it’s from the board, now. Good to see Motorhead is still around 🙂 And no more inclined to roll over and assimilate than I am. My job is making me sick. My job is making me sick. Well, I guess it isn’t the job itself, per se, it’s the fact that my level of work related stress is so incredibly high, and my ability to recover between shifts is non-existent, that my defenses are simply down for the count. When I say sick, I don’t mean, “oh, well I just can’t face going to work today so I’m going to call out” kind of sick. I mean, pulling over on the side of the road on the way to to work so I can puke, stopping in gas stations to purge myself in the bathroom kind of sick. I’ve had dysentery and frankly I’ll take that over this. It is without a doubt stress related but legitimate illness none the less. Fevers, the whole nine yards. Even water becomes a luxury because I can’t keep it down. This is the second time in a month this has happened to me; I’ve also begun having migraines with disturbing regularity after a period of several years with less than one per year. These too have picked up in severity; I never used to actually vomit with migraines although I would be nauseated. I’m not so lucky any more. When I went from being a firefighter paramedic and working 24 hour shifts to being a nurse and working 12 hour shifts, probably the biggest surprise to me was the fact that working a 12 hour shift is as mentally and sometimes physically taxing as working a 24. That’s because as a nurse, you don’t get ‘down time’ in between patients. You always have at least one, usually more, and you are always thinking ahead to what has been done, what still needs to be done, who is sitting in triage and will probably be your next patient and what will be need to be done immediately for that patient, and so on…for 12 hours. Now, I’ve worked 24 hour shifts and worked two jobs at a time for nearly 20 years, but this is without a doubt the most stressful job I’ve ever done. Add to that the fact that our administration is –wasting- hundreds of thousands of dollars on ‘consulting groups’ to *supposedly* increase our productivity, and we are in a constant state of flux because of that, and there are now constant and unrelenting pressures on us to produce as though we were assembly line worker s pumping out auto parts, and you can maybe understand that my level of stress has been bumped up by more than a few notches in the last eight months or so. The fact that we are a not for profit organization, and that people come to our facility from all over the Valley specifically because of the reputation for quality care we have sustained for nearly 50 years, doesn’t seem to matter to our administration. They have lost sight of the fact that we are non-profit, and only care about increasing the profit margins, I would guess so that their salaries remain completely OUT of line with the rest of the line staff, and so that they continue to accrue ridiculous bonuses for said ‘productivity’. If you are getting the idea that I’m bitter about that you’d be right. If you are getting the idea that I’m not alone in my feelings of stress and alienation you’d also be right on the mark. Administration approved the purchase of pizza for the entire hospital last week….big whoop. Yeah, that makes up for treating us like crap for the last year. Totally. As you might guess, it shows in sick calls, in short staffing, in the numbers of people – many of whom have been at our facility their entire careers – leaving for other places and jobs where they aren’t treated as cattle herders and brow beaten constantly. Our facility got rid of the incentive pay for extra shifts a couple of years ago; I recently heard it is probably being brought back because it’s nearly impossible to get people to come in on their days off any more. They can’t get pool people to stay because they can work elsewhere and be treated better (which is saying something very significant when you consider that our facility, for many years, was almost impossible to get hired into unless someone died) In fact, it’s now down to when they DO get someone to work extra, they send people home based on how much they make per hour rather than who is next on the go home list. I actually think the way our facility’s administration thinks is related to our culture at large. The dysfunctional value they place on themselves as being necessary to the functioning of the facility while they remain completely oblivious to the problems at the level of the baseline reason for the facility’s existence seems to be to be related to the profits and bonuses of Wall Street executives. Their bonuses too are completely out of line with the line staff salaries. They too value themselves as entirely too valuable while ignoring the fact that their companies wouldn’t work without the little people do actually do work for them. I recently heard on BBC radio that a study was recently done using college level business students at a major university. The premise of the study was to see if bonuses raised productivity or if the threat of punishment – to management – raised it. It turns out the threat of punishment – not only losing bonuses, but losing position, motivated managers to do their job properly – to actually manage – and be involved in the day to day activities that were tied to the punishment. Performance significantly increased for the group with the threat of punishment. Now, what that says about human nature I wouldn’t like to guess, but I think it’s worth noting that our administration is utilizing the threat of punishment – for lower level staff – as a stick while keeping any and all bonuses for our increased productivity for themselves. I have no good conclusion for this rant except to point out that I – someone who has been pretty resilient for a lifetime – am becoming as I get older, prey to stress related illness. I shudder to think what that might mean if I were to become disabled. Ugh. I hate technology sometimes. We have two laptops; one is a gateway that’s nearly ten years old — Mr. Tin Foil bought it for me when I first went back to school. The other is a Vaio, which he bought to take with him to Hawaii when he worked there, as well as going with him all over the Western Hemisphere when he worked for a company that sent him out weekly. It’s about five years old. Well, in the last probably six months or so, the Gateway (which is the backup laptop) and the Vaio both have been getting QUITE cranky. The poor gateway is just old and slow; the Vaio keeps doing things like refusing to recognize the printer, insisting we have no internet (which we do), refusing to recognize our home network, crashing in the middle of important things, and so on. Since he uses the desktop now that he doesn’t travel any more, and I use the laptop since I stand up and take it around the house with me frequently, this has been a huge issue — we’re both going to school, both our classes are on line, and we both need to have access to a computer to get our stuff done, often at the same time. I gave up today when I could no longer download any podcasts, and it took restarting the computer three times to be able to access my online class, which ate up nearly an hour and a half. We broke down and bought a new laptop. I am NOT happy about the price, but I would be much more unhappy not to graduate in May. I am pretty unhappy about the fact that laptops don’t last very long. I’m told that ours had a long life though, so maybe I just am expecting too much. I was pretty upset when my Ipod started crapping out too, but the people at the store were absolutely incredulous that it’s lasted me eight years. Guess it’s a matter of relativity. I’m getting a wood stove for sure now, though. I gotta balance this out with a low tech option or it will make me crazy.